I requested that he, on an on call basis, drive to the freight terminal and pick up our door. I then asked him (Scott) to drive over an hour south and install this door on Saturday if it arrived early enough or Monday if it arrived later. He made a phone call and called me back 5 minutes later. In minutes he assembled a crew for a Saturday install and rearranged his schedule for a Monday install. He talked with Kim until after Midnight on Friday. He called Conway for us to try and figure out if the freight arrived. Once the freight did arrive at the terminal he drove and picked it up on Saturday. He is on site right now installing this door for us. Scott went above and beyond for Come/I. He took ownership of our issue and handled it without hesitation. This was a fantastic vendor experience. Cornell Storefronts sincerely appreciates the work that was done to get the job completed. 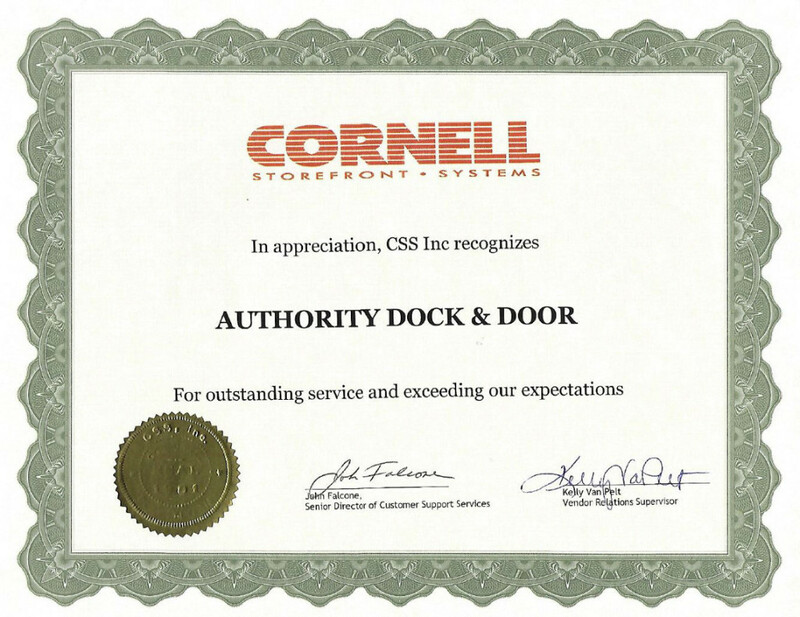 We are pleased that Authority Dock & Door has performed beyond our high expectations. Thank you again and we look forward to continuing to build on this partnership for the future! I have been working with a new installer that was recommended to me by a Door Vendor. I thought everything was going okay until I received a very up front e-mail from the customer letting me know that if things didn’t change that we would be in jeopardy of not receiving further bid requests in the future and that they would find another installer on their own to complete my job. I didn’t take this lightly and immediately called Authority Dock and Door and let them know the situation and Josh contacted me the next morning. Josh left that evening and travelled all night to arrive in MI and get to the job sit before noon the next day. He worked with the installation company’s son, who was green at this magnitude of a job and Josh took him under his wing and taught him how to manage his team and how to have better communication and to be a leader to his men. Josh stayed there in below freezing conditions and white out flurries that day and the next day and he was so well received by the customer and the installer that they are still talking about him and how much they appreciated his attitude and work ethic. I can’t thank Josh enough for saving our reputation and being a huge team player. The customer is now getting daily updates from the installer on what has been completed and what is on the docket for the next day. The install crew did a great job. Arrived on time and completed with all the old parts removed. The openers work great, are all programmed into my vehicles and connected to the web. Thanks for the great service.